We love it when an ad comes with a "Don't try this at home" disclaimer, because you know you're about to see something that somebody's gonna want to try at home, and it will fuel many future guffaws. But seriously, though, we hope you won't try this at home. Ahead of the launch of the Assassin's Creed film on Jan. 1, Britain's Channel 4 and Twentieth Century Fox broadcast an impressive live TV spot on Sunday night featuring stuntman Dave Grant in full Assassin costume, freefalling 100 feet at over 50 miles per hour … with nothing holding him back. While the jump doesn't seem as crazy as, say, Felix Baumgartner's leap from space for Red Bull, anybody who's ever tried diving into a pool from high up—and who, despite their best efforts, landed on their bellies—can probably attest to the difficulty of falling properly without protective gear. According to Channel 4's agency principal Angus Mitchell, the ad was conceived by 4 Sales' creative arm PL4Y. It was produced by The Outfit. "We're incredibly excited to be making TV history with Twentieth Century Fox by attempting something no other broadcaster has ever dared to," says Mitchell. The act is a replication of the Leap of Faith from the game, which is also in the movie—and isn't too far from how it was shot on set: Director Justin Kurzel wanted real-life stunts instead of CGI whenever possible, which is part of what this ad is promoting. "In a world of CGI film action sequences, we wanted to pay homage to the use of real stunt action sequences used in the film," explains founding partner Charlie Read of The Outfit. 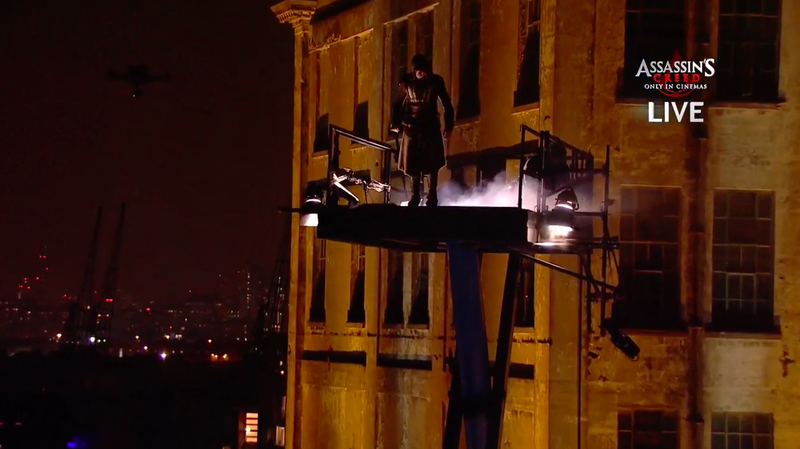 "By recreating a live Leap of Faith, we wanted to give the audience an insight into the skill and thrill of real stunts and get people excited about the theatrical release." If you want Fassbender's take on the mind-bending jump, here's a video of him talking about it. "The action sequences in the movie are shot in an old-school fashion, shot in geographical locations with real people, with very little CGI or special effects," Fassbender says. "In the movie, Damien Walters performed a record-breaking Leap of Faith from 120 feet, unassisted by wires and ropes, which was amazing to see." The ad featuring Grant was shot outdoors at Millennium Mills, a former flour mill in Newham, London. Grant is touted as among the few stuntmen able to perform a freefall at 100 feet, so such jumps are rarely attempted, even on film sets. Though Walters jumped from 20 feet higher, his situation was more controlled—Grant had to pull it off in the dark, amid wintery cold, and live on national TV, leaving no room for error. "Leap of Faith Live" was directed by Matt Askem and aired during Channel 4's drama Humans. It was preceded by teasers that featured straplines like "No harness. No CGI. No going back." Viewers could comment on it using hashtag #C4LeapOfFaith. "Assassin's Creed is going to be the event movie of 2017, with nail-biting, never-seen-before, breathtaking action sequences," says Cameron Saunders, managing director of U.K. theatrical at Twentieth Century Fox. "What better way to bring a taste of this adrenaline to audiences throughout the U.K. than this daring live Leap of Faith? There's plenty more where this came from when the movie releases on Jan. 1." It certainly raises expectations. Check out the making-of below.